Long hair often gets in your way, so find a solution by using hair clips. They are often less damaging than hair bands or ponytail holders, there are many fashionable styles available, and you can easily and quickly create a variety of looks ranging from casual to formal. The most common hair clip you see these days is the "claw" version, which looks exactly as it sounds. Claw clips became popular in the 1990s and remain so to this day. They are available in a wide range of sizes, depending on the thickness and length of your hair. However, there are many other types of hair clips and accessories available, depending on the type of style you want to create. These clips don't look like an alligator but resemble the clips on a car battery charger. Most people don't wear them around; instead they are used to clip sections of hair out of the way while you blow-dry or style. If you were a young girl in the 1980s, you likely owned at least one banana clip. They looked like some sort of primitive jaw; two long, curved combs secured together at each end. The hair cascades down the back in a pony-tail effect. Barrettes are a popular option for young girls, although there are plenty of adult versions, too. They are typically made from metal but also plastic and wood. Barrettes are usually bar shaped and fit flat to your head, clipping back a small portion of hair. The most basic form of a hair clip is the bobby pin, a crinkled metal clip that holds back small portions of hair. These clips are ideal for pinning updos in place or holding your bangs away from your face while they grow out. With all the types of hair clips available, you can choose the style that works best with your hair. 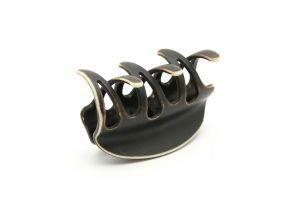 If you have long, thick hair, a large claw clip can be your best friend, especially during hot summer months. Clips are much more gentle to your hair than bands, so you can avoid split ends. Store spare clips in your desk or purse, and you can pull all of your hair up and off your neck and create a chic updo in seconds. To easily clip up your hair, begin by gathering it in a low ponytail at the nape of your neck. Twist it around all the way to the ends, and then hold it against the back of your head. Carefully secure the hair claw around the twist, at about the middle of your head. Allow the ends to stick up or cascade down, depending on the length of your hair. You may also use smaller claw clips to hold the top portion of your hair out of your face, which works especially well if you have shorter hair. Use multiple small clips to capture fly-aways in layered haircuts. For a more formal look, choose an embellished hair clip and and curl your hair to add more volume, or further accessorize a simple updo with gem-studded barrettes. Finally, hair clips are a great solution for hair styles for young girls, who often won't sit still long enough to secure more complicated accessories. Next time you're at the drugstore or beauty supply shop, invest in a few hair clips. They are your answer to bad hair days, dirty hair days, and even special occasions. They are perhaps one of the most versatile hair accessories ever invented!